I love a lot of things in this world. But the short list includes books and chocolate and craft beverages. So, when I heard from Cheryl Lane of Double Barley Brewing that an award-winning chocolate company would be setting-up shop at the brewery, I was way more than excited. I’m sure almost everyone has had the pleasure of pairing chocolate and wine, but if you have not yet tried matching chocolate and beer then you’re just not living your best life. That’s my humble opinion. I recently commented that Johnston County has an entrepreneurial spirit matched only be the spirit of partnership. You cannot take a tour at one location on the Beer, Wine, and Shine Trail without hearing about at least one other location on the trail and beyond. Paul and Lynn Auclair of Deep River Brewing are friends with Jerry Stephenson over at Redneck BBQ Lab, who gets his cornbread mix from Atkinson’s Milling Co., who also sells grits to Double Barley Brewing for one of their seasonal beers. Bob Hinnant and Lane Gregory, the county’s two wine makers, share best practices… and everybody just loves Jeremy Norris’s Broadslab moonshine. 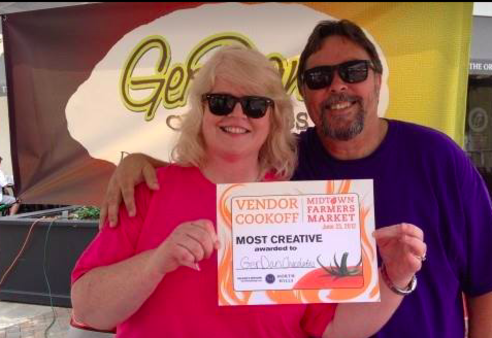 It is this spirit of sharing and of piecing together something to make a greater whole that lead Cheryl and Larry Lane to open their brewery, their kitchen, and their business to Geraldine and Dan Doren of GerDan chocolates. To figure how this tasty confection of a business came to be, and where it’s going, I interviewed Geraldine. Find out everything there is to know about GerDan by reading on. How did GerDan start? Tell me a little about the history of the company. We had friends who were chefs and owned catering companies and were always saying how difficult it was to work with chocolate. 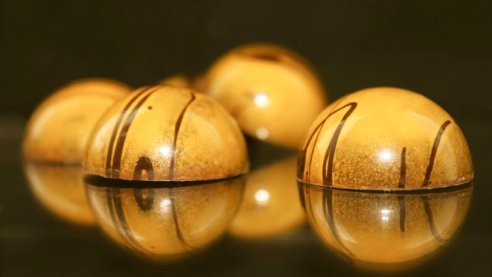 Dan taught himself how to temper chocolate and started making bonbons for family gatherings and the holidays. Both family and friends urged us to start selling them and so we did. We formed GerDan in 2011 and would make our candies after work and then sell them at farmers&apos; markets on the weekends. It just grew from there. You won an award earlier this year. Tell me about that. How did it come about and what was it for? 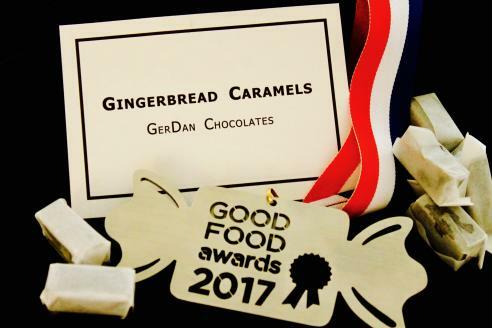 Yes, indeed we did, we won a Good Food Award in the confections category for our Gingerbread Caramel which was made using NC cream and local ginger as well as organic sugar, molasses and cinnamon. The inspiration for the caramel came from a cake my mother used to enjoy back in Ireland and so I transferred the flavors to a caramel. The Good Food Awards competition is held annually for outstanding American craft food producers who make tasty, authentic, and responsibly produced products. Their focus in the confections category is "celebrating confections – whether chocolate covered bonbons or gloriously simple caramels – produced using locally grown, natural, minimally processed ingredients that celebrate regional culture and tradition, highlight American terroir, and exemplify excellence in the candy making craft." You started out in Raleigh. Why move to Johnston County and Double Barley Brewing? We were sharing a working space with a local winery in North Raleigh. When we came back from receiving our Good Food Award in January, the Winery decided they were not going to renew the lease and so we had to look for a new location to produce our confection. Lucky for us, Cheryl and Larry offered us the use of their kitchen on Mondays and Tuesdays when the taproom is closed. What are some of the items you make at GerDan with chocolate? What does the future hold for you? What plans do you have for the rest of 2017? With both Dan and I making our candy full time now, we plan to continue expanding our bonbon and chocolate bar selection. Before the month is over we hope to have our website up and running. Where can visitors experience/buy your chocolate? We do pop-up events all over town so it is best to check our Facebook page and our website to see where we will be selling next. In the near future, we hope to have a selection of our confections for sale at Double Barley Brewery. Do you do special events, weddings, large orders? We certainly do. We are always willing to discuss what you would like to make your special day a little sweeter. So, there you have it. 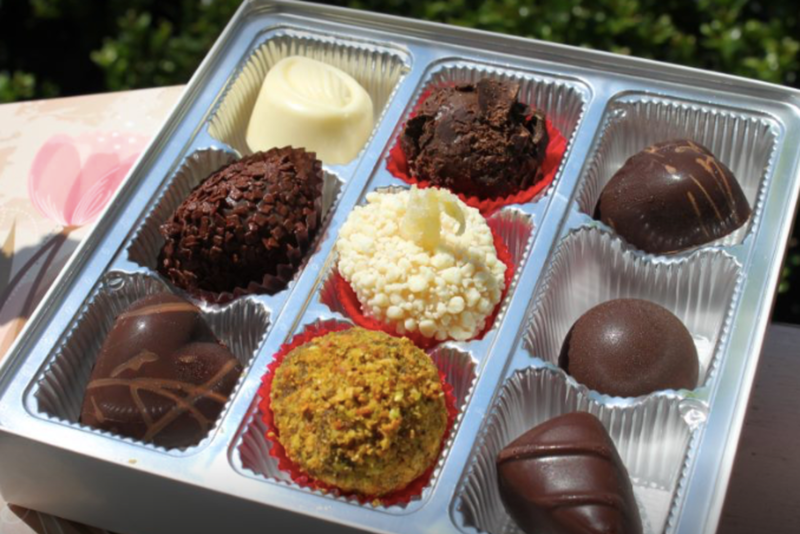 A little more about the amazing GerDan chocolates… of which I have had a few. The Brew Chews are my new weakness. For the most up to date information on GerDan, like their Facebook page. We here at the Visitors Bureau will also keep everyone updated on when GerDan chocolates will be available “over the counter” at Double Barley Brewing.